When reading this article, please keep in mind that I am, in point of fact, actually a crotchety old teetotaler in a 27-year old’s body. I hate people, alcohol, and loud music, in that order. It’s a shock I’m still single. 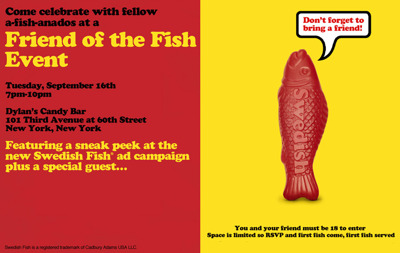 A while back Brian got an invitation to attend a party hosted by Swedish Fish to celebrate their new ad campaign. Since I’m the only staff Addict in New York City, he passed the invite on to me. I asked my friend Jane to go with me, and on Tuesday night I headed into Manhattan to meet her and go together to Dylan’s Candy Bar. Being the overall moron that I am, I completely forgot to bring a digital camera with me. Duh. They took pictures of us with a giant Swedish Fish as we went up, but I’m telling you now, I will not be sharing them. Ever. Don’t ask. It won’t happen. Jane, however, had a camera phone and she got this image of what turned out to be the most interesting thing of the evening – candy sushi in the flesh! I didn’t try it (sour isn’t my thing) but Jane said it was pretty gross – they didn’t get the memo about using Rice Krispie Treats as the inside and used real rice instead. There were Swedish Fish absolutely everywhere – on bowls, in the tables, behind the bar… too bad I don’t really like them, huh? I mean, in terms of flavor they’re ok, but the effort/pleasure ratio just isn’t to my liking. The party was supposed to last from 7 until 10pm, but there was no way that was going to happen. You see, while it might have been nice to meet some other people in the candy industry, talk to some new folks, etc., it was a physical impossibility. There was no humanely possible way to hear anything in there, as music was being absolutely blasted into the relatively small room. Couple that with all the people trying their best to make themselves heard (i.e., screaming at one another), and you can see how it wasn’t exactly conducive to making contacts. We bailed after an hour (after standing around the steps wondering who we had to pay off to get a gift bag – finally Jane got annoyed and went up and asked for one). Oh, so what about the new ad campaign; that’s why we were there, right? Ok, here it is: Swedish Fish, A Friend You Can Eat. Am I the only one whose mind immediately goes to really really bad places when I hear that tagline? Anyway, the images they use are cute – a kitten between two slices of bread versus a Swedish Fish, a teddy bear in a grill versus a Swedish Fish, etc. It’s not exactly revolutionary, but it’s cute. And no, I have no idea who the “special guest” was. With the amount of alcohol being consumed there, I’m not sure anyone else knows either…. Sour Punch Video Contest: Like sour candy? Get your camera out and win $5000! I think we were twins separated at birth! Except for the fact that I’m 33, that’s me – “a crotchety old teetotaler in a 27-year oldâ€™s body. I hate people, alcohol, and loud music, in that order.” And you’re right, what’s with us being single? I enjoyed reading your article. Though I must admit it was kind of like reading a Stephen King novel on speed. As a former events coordinator, your detailed description of the party sent shivers down my spine! As a Swede, I find the most interesting thing about “Swedish Fish” that you can’t buy them in Sweden! Incredibly annoying really, I’ve tried them when in the US and I really like them. We do have a fish-shaped gummy made by the same company, but the texture is totally different and so is the flavor. I totally love swedish fish — but all I can ever find are the packages with all red fish in them. Hopefully this party will kick off a new infusion of multicolored fish packages! what do you mean about the effort/pleasure ratio? how is it hard to eat a swedish fish? i didn’t understand that, but i’m right with you on everything else – i too am 27, single, and perfectly content to continue avoiding people and noise. Well, to me they’re just a touch too hard to chew – too firm to be a true gummi. A bit softer and I’d probably be addicted to them. Candy sushi with real rice sounds absolutely disgusting, but the party sounded like something I might have enjoyed, despite the fact that I too generally avoid booze, people and noise (not necessarily in that order). Then again, I’m not single, so maybe having a live-in dork to drag with me makes the idea more palatable? I hate Swedish Fish but I think this would have been fun to go to just for the sake of being able to go to a candy party. And for the record, I hate people too but I love beer and loud music. what a great candy , thats been around a long time !!!! LOL@ “Jane got annoyed and went up and asked for one.” It was more like “Caitlin got increasingly irritated until Jane sucked it up and went and asked for one!” But otherwise, completely accurate… especially the part where she’s an old lady! Oh, and since I’m not a teetotaler, I can add to the review that the Swedish Fish margarita was delicious. I would have tried the other drinks as well, but all I’d eaten for dinner was…. well, Swedish Fish out of a bowl and a piece of candy sushi (with real rice!! bleh!). So that would have been a bad idea.